Oil prices steadied on Tuesday, depressed by record Saudi production but supported by expectations that oil exporters would agree to cut output at an OPEC meeting next week. Oil prices are down by almost a third since early October, weighed down by an emerging supply overhang and widespread financial market weakness. Prices rallied sharply on Monday, with Brent rising almost 2.9 percent, but the market has struggled to stay positive.“The energy complex is making a half-hearted attempt to extend gains,” said Stephen Brennock, analyst at London brokerage PVM Oil. “However, upside potential is being capped by two upcoming risk events, namely the G20 summit and next week’s OPEC meeting. A wait-and-see approach is therefore likely to prevail, which in turn will act as a damper on any looming price swings.” - said Brennock for Reuters. Leaders of the Group of 20 nations (G20), the world’s biggest economies, meet on Nov. 30 and Dec. 1, with the trade war between Washington and Beijing top of the agenda. With the top three crude producers - Russia, the United States and Saudi Arabia - all present, oil policy is expected to be discussed. OPEC meets in Vienna on Dec. 6 to discuss output policy together with some non-OPEC producers, including Russia. 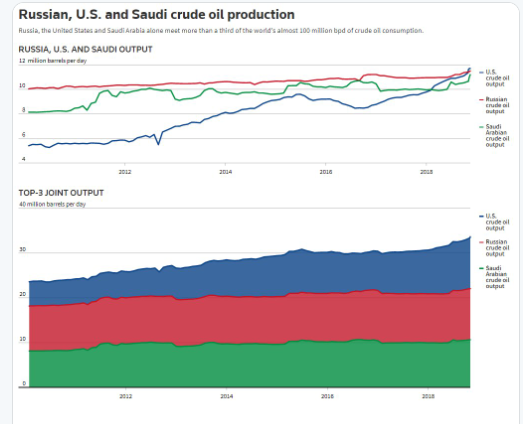 Is there any weekly or monthly numbers which Saudi Arabia declares for its production numbers? Or these numbers simply come ad-hoc? Calculation and pressure are already starting: Kuwait oil minister says "too early to talk about OPEC + cut ..."
In August saw the largest annual increase in U.S. the oil production in 98 years. The American industry added, in crude and other oil liquids, nearly 3m b/d, roughly the equivalent of what Kuwait pumps, than it did in the same month last year..Nightmare for OPEC. It becomes interesting ahead of OPEC meetings. Ecuador (one of OPEC's smallest members) says it will support an OPEC the oil output cut. Ecuador also says it will increase its own oil production next year. Not only for OPEC... I guess it is also unsustainable for most US shale producers. And think that 2m b/d more from US shale oil are supposed to add next year with the new pipelines... Really ? Probably, yes. Permian oil producers do not make any money either with the price differential... The USA, Russia and Saudi Arabia together now pump more than a 3rd of the 100 million barrels of the oil the world consumes every day..